When measuring for your screens please use the diagrams below as a guide. Your screens will attach to the fixed part of your window frames so this is where the measurements need to be taken from. PLEASE TAKE THE MEASUREMENTS WITH YOUR WINDOWS OPEN. Unfortunately Cataire cannot offer refunds if measurements have been submitted incorrectly. For any queries please feel free to contact a member of the Cataire team before ordering on 01789 576026. Please take your measurements in cms. To ensure the screens are as effective as they can be we have a maximum size that we can produce of 130cm by 120cm for lite screens and 120cm and 110cm for original screens. If you require a screen larger than this please call us to discuss. Measurement A: Height from top to the bottom to the outside edge of the fixed window frame. 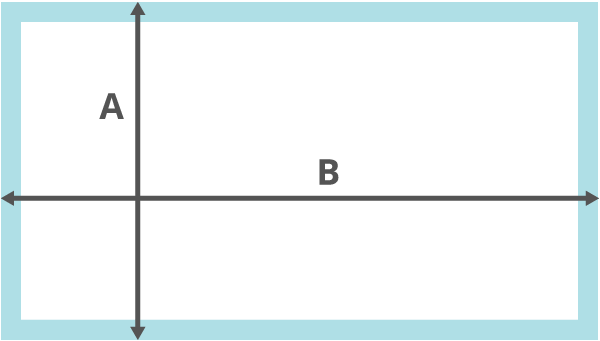 Measurement B: Width from left to right of the outside edge of the fixed window frame. Measurement C: Height from top to bottom of the inside edge of the fixed window frame. 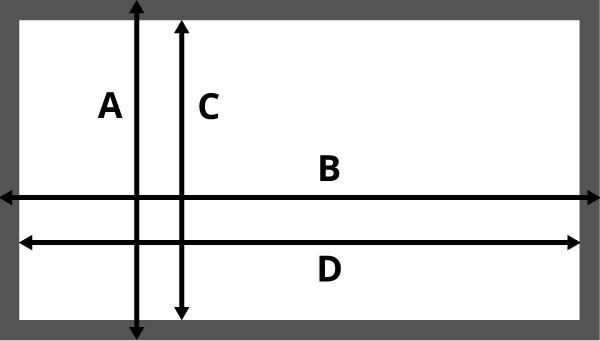 Measurement D: Width from left to right of the inside edge of the fixed window frame. The Cataire original screens are priced £42.50 for the small and £53.00 for the large. The Cataire lite screens are priced £29.50 for the small and £39.50 for the large. Please pop your measurements into the below calculator to see which size Cataire screen you will need.